Lusong Gunboat is a Japanese ship. According to our boatman, the Japanese hid the boat from the Americans by covering it with fresh/green leaves so it will look like ani island or mountain. Unfotunately, the leaves dried up and the boat was unmasked. The American planes saw it and bombed it. 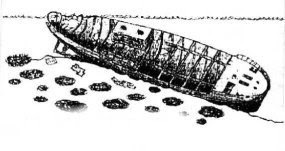 Here is a sketch of the shipwreck (from www.coronwrecks.com). The max depth is 11 meters. Actually the front will show during low tide. On high tide, you can just step on it. Scuba divers usually enters the ship's room.